I got many requests to provide guide to build simple 230V to 1,3,5 Watt LED driver in response to my simple led driver diagram. 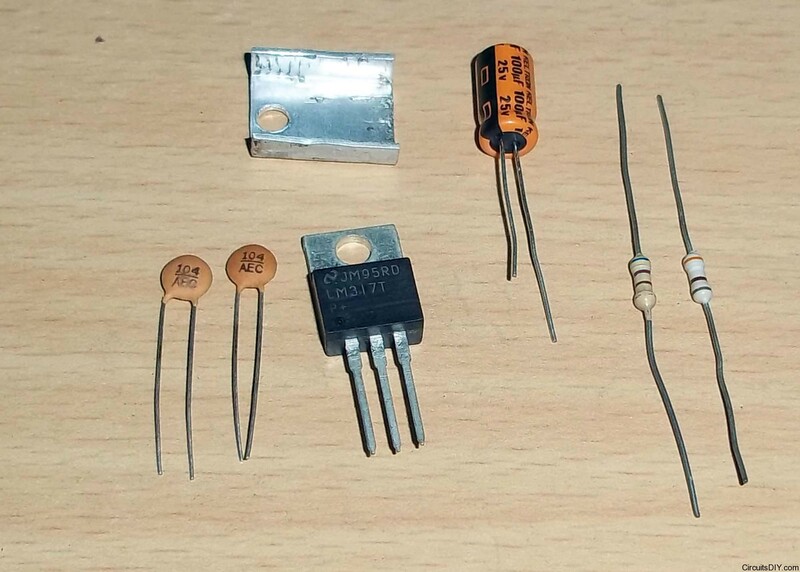 So, below I’m writing an article on making of a high power LED driver circuit. The below device is able to run upto 5Watt LEDs from the LED supply line and 18Watts of 12V LED strips. 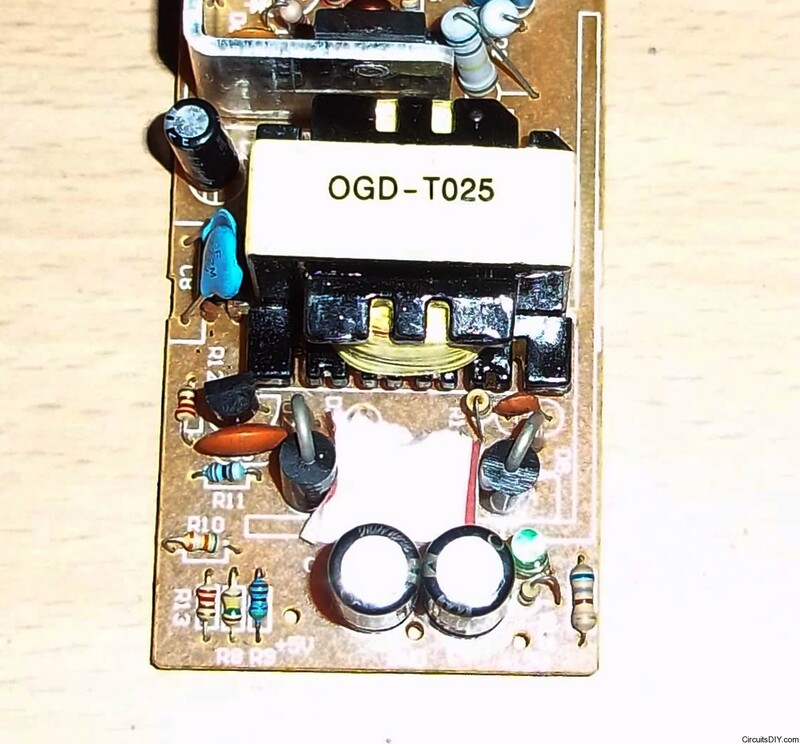 I’ve made the following article specially for people new to electronics so there is many small steps included which may look like verbose in view of a pro technician. Also since the following guide has many images, I request you to load the page first then start reading. To make yourself, please read this article thoroughly and ask any doubts or questions below in the comments form. Don’t hesitate to contact me because any carefulness or mistake may cause a damage to the unit or cause you a lethal shock as here we’re working with mains line of 100-240V and it’s not safe as a battery is. If you’re doing this kind of work with high voltages, you should do this under supervision of some other person who will be able to save you in case you get electrocuted. A LM317 adjustable regulator IC with a small heatsink. Two 0.1uF/25V capacitor (104) and one 100uF/25V capacitor. Screw terminal connector, 3rails and some wires(6″ will do, get atleast 0.5mm copper wire). The main part of this circuit is a SMPS that is easily available in the market. 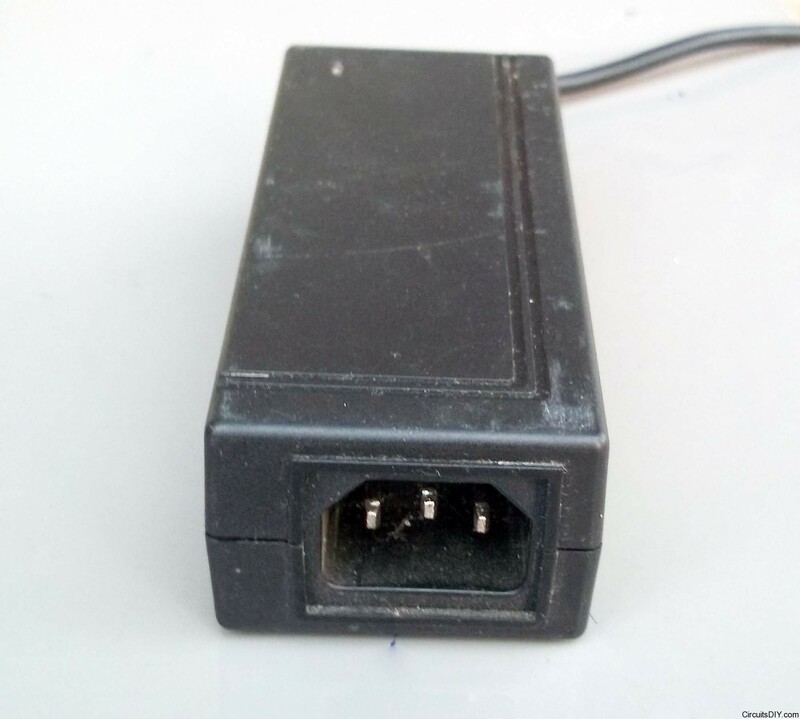 This is common adapter for USB HDDs and you can get one in any computer shop. I got an used from a shop at Rs. 150 (~$3 USD). If you can get higher rated like 2Amps one, it’s better. It’s time to open the case and expose the inner PCB. This may look like the below. Now it’s time to start soldering iron. You can see +5V, GND and +12V labeling near the three wire’s holes. 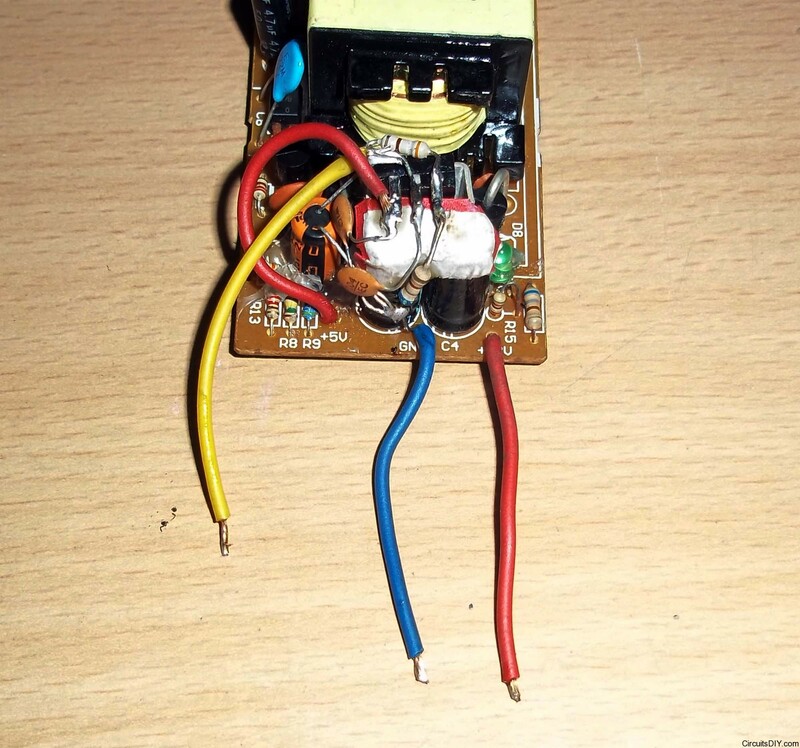 If it’s not, then power the circuit on and test with multimeter to know the voltages for the wires. Be careful if you’re powering the device with PCB open. Now, desolder the three wires from the PCB. Now, it’s time for some mathematical calculations. A high power white LED of 1,3 or 5watt have 3.4V forward voltage and respective current of say 290mA, 880mA and 1470mA. 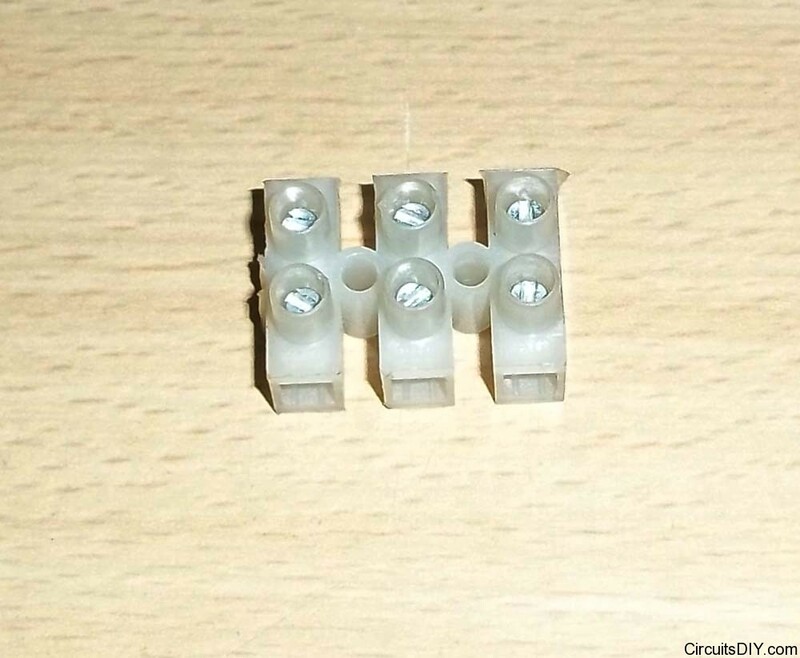 For these Leds’ power rail, we need to make 3.4V supply. We have 12V and 5V supply from the circuit board in hand. We’ll use the 12V supply rail for output to 12V LED strips and the 5V to step down to 3.4V using some circuit. The 12V rail is rated for 1.5Amps so it will be able to handle a load of 18Watts of 12V LED strip. 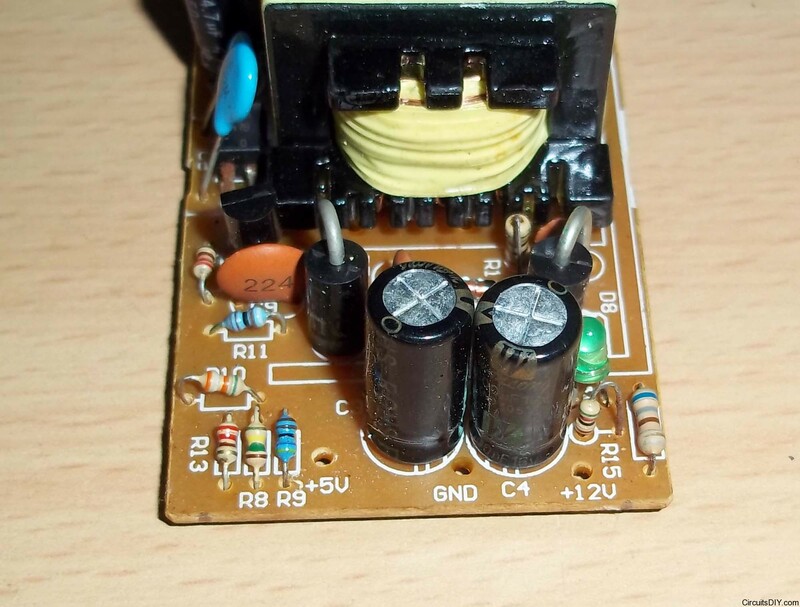 For the 3.4V output, we”ll use a positive adjustable voltage regulator, LM317T. It’s a very common regulator and easily available. We have to take a look at the datasheet for the device to calculate the values of passives for a 3.4V output. 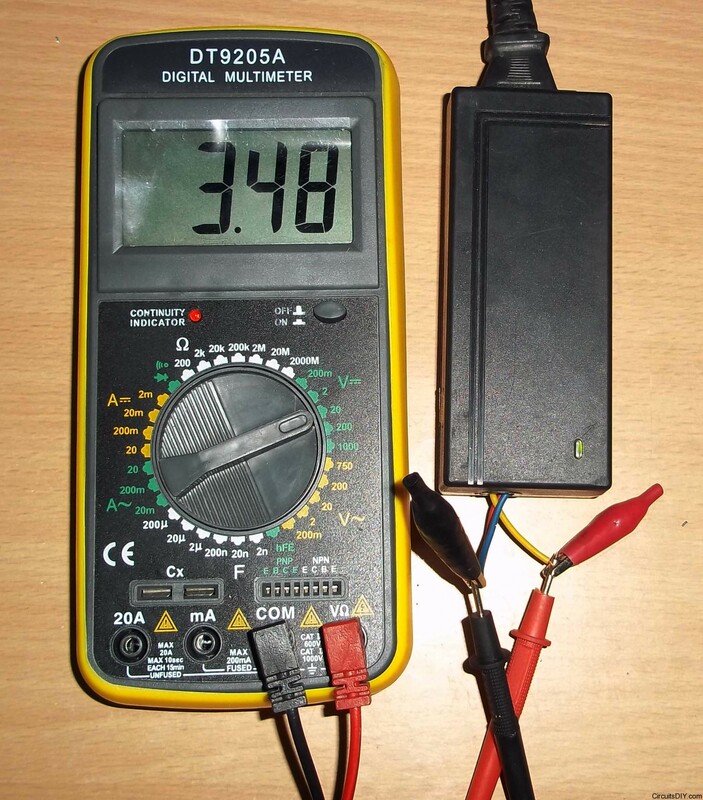 LM317 – 3-Terminal Adjustable Regulator From the datasheet we can see that the output voltage is adjusted by values of two resistors. We should have no problem in running LED with 3.43V so this is ok. Here are the needed parts. This includes LM317, 2x 0.1uF caps, 100uF cap, 680R and 390R, and a small heatsink. At 5Watts load at 3.43V it will consume 1.457725947521866Amps or 1.46Amps. 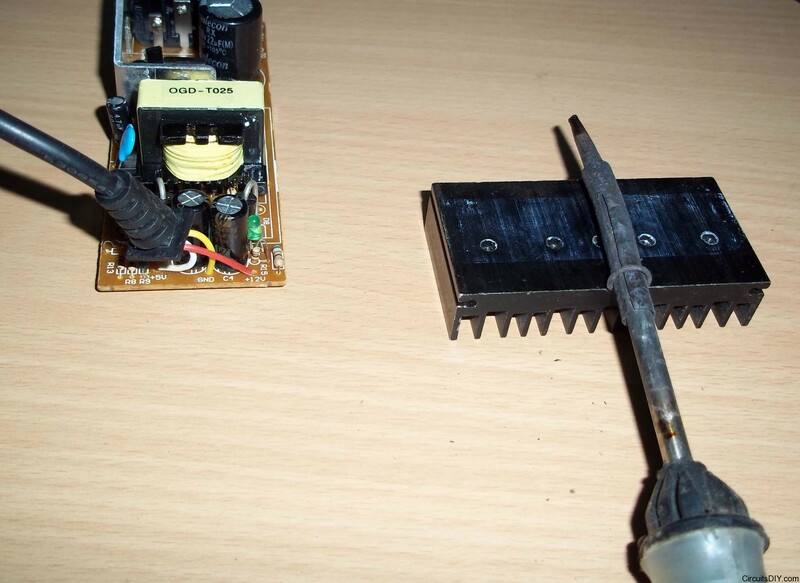 For this low heat, the small heatsink is enough. Now, find a space in the PCB to place the LM317+heatsink. Find a space where there is small space left at upside so that you can solder wires. Bend the pins and cut the extra legs. Now, add a paper sticker or tape to the area below the selected place for the IC+heatsink. This will ensure there will be no shorts due to the heatsink. Now secure the IC+heatsink in place using hot melt glue. Also place the 100uF capacitor in the space next to it. Now connect the parts as following image. IC LM317’s 1’st pin goes to one pin of 680R resistor and one pin of 390R resistor. The second pin of 680R goes to GND or 0V of the SMPS. The second pin of 390R goes to the Vout pin of LM317, that’s the 2’nd pin. Connect the +ve pin of 100uF capacitor, one pin of one 0.1uF capacitor and voltage out’s wire also to the 2’nd pin of the IC. Now connect one pin of the 2’nd 0.1uF capacitor to the 3’rd pin of LM317 and connect the 5V line of the SMPS there. Now connect the remaining two open pins of the two 0.1uF capacitor and the -ve pin of the 100uF capacitor to the GND or 0V of the SMPS. Now it’s time for closing the cover and test the output. It’s showing 3.48V on the 3.43V line. 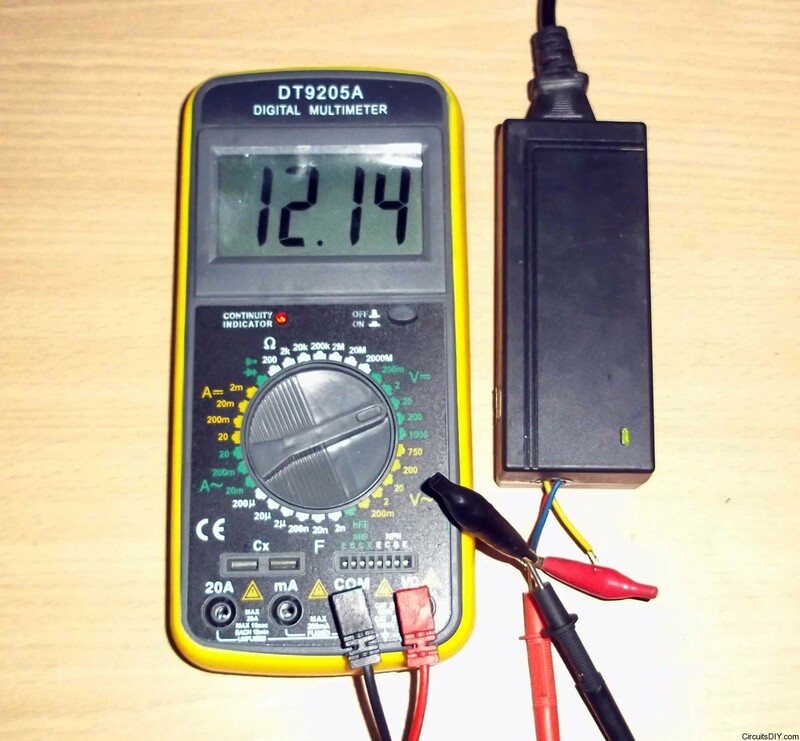 This kind of slight overvoltage is normal on no-load status. It’s also showing 12.14 on the 12V output line at no load. It’s time to connect the following screw terminal strips now. Connect the GND to middle and 3.43V and 12V to the two sides of strip. 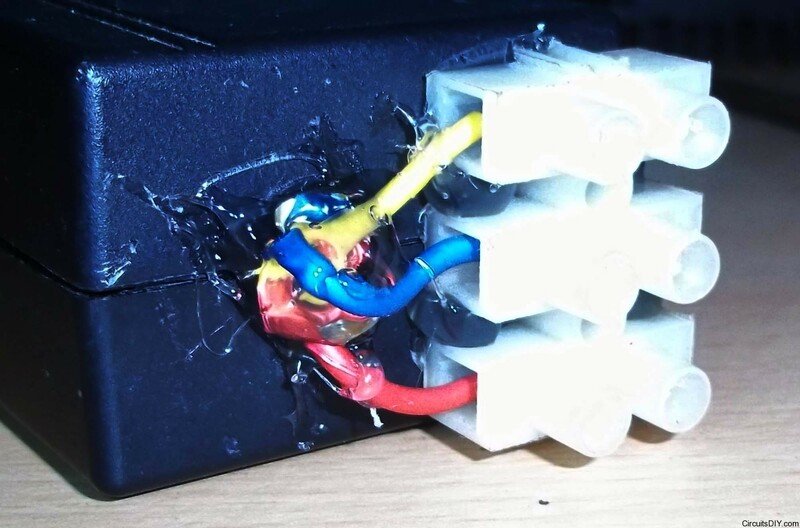 Now, secure the connector in place using hot glue and also cover the hole with the glue to seal the hole. Now, the LED driver is ready to use in any application. This is the driver in action. How many 3w led’s could one of these handle? Is there any way to make it dimmable as well? 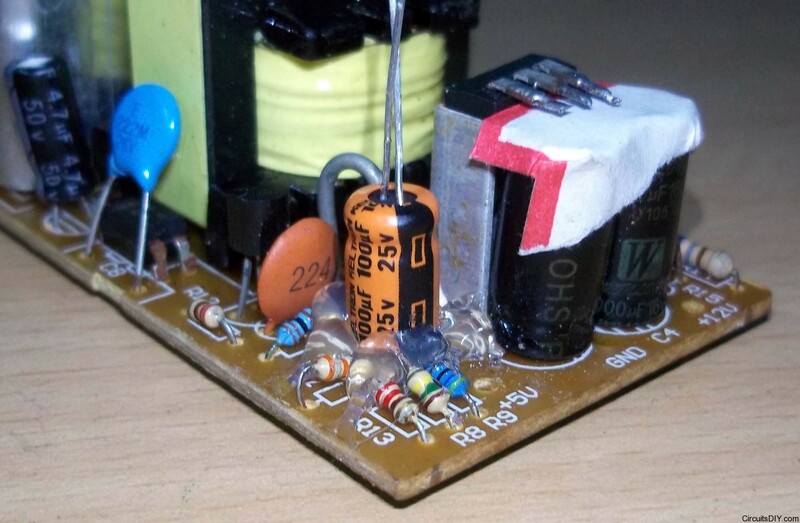 is the diode, resistor and caps absolutely necessary? can i just use a pot between output and adj on the LM317? I am trying to make a circuit that can drive 1 350ma cree LED with a 7.4 li-ion battery using the pot as a dimmer switch. i am trying to copy what a buckpuck does and all the dimming buckpuck from ledsupply i have seen have 6 wires. thank you for your responses. this site has great info. i am not an electrician or engineer so please keep the language very elementary. thank you! 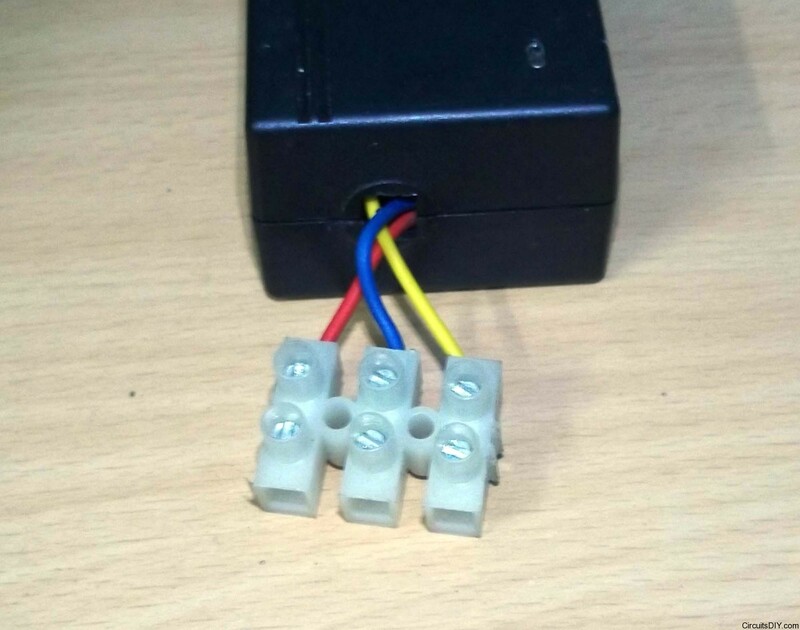 You have made the common error of controling voltage to the LEDs. LEDs need current control for consistant brightness and long life. 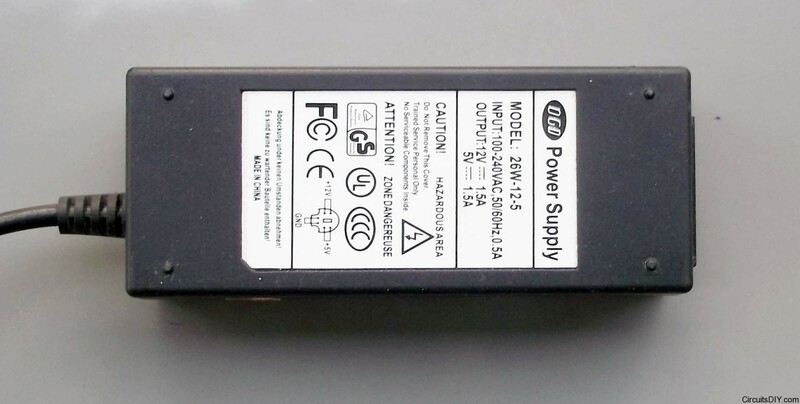 i have this SMPS…i was using this one on my external HDD.. now its dead (i think so). Mine it’s the same, but I already open it and on the back of the board, near the 120vac is I think a resistor, But mine is blown, can you tell me the value? 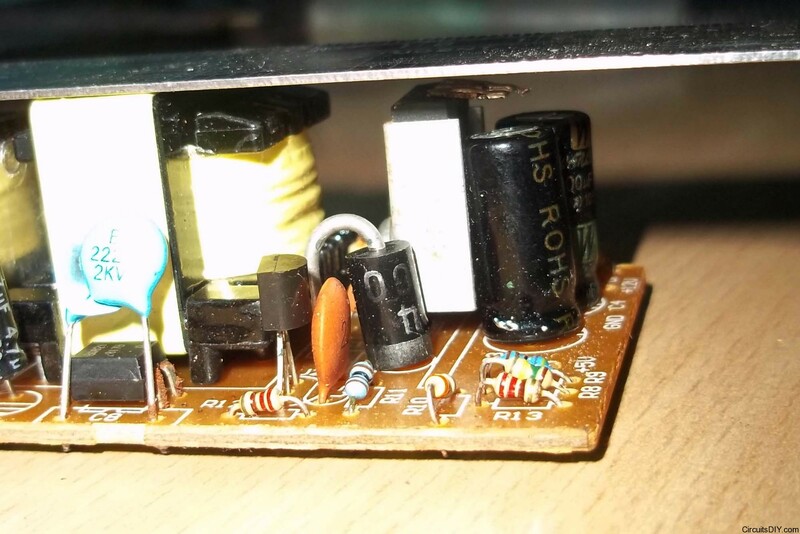 on November 13, 2012 at 9:41 pm said: Check the driving MOSFET. In most cases the MOSFET is burnt. 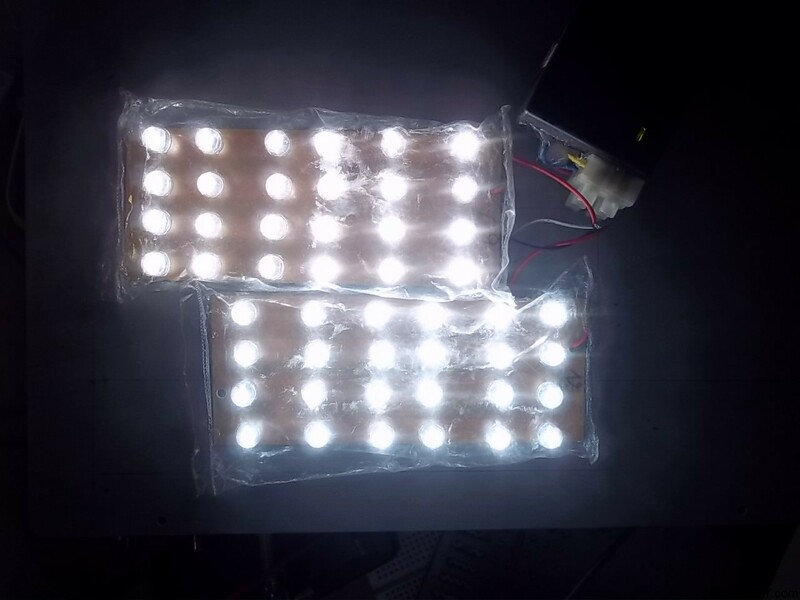 I want to make the cheapest Led Driver for 36 watt, I have 11 parallel & 11 series Led Panel. I have 4 panels with same Combination interconnected. Pls give me the guidance. Will you pl provide me schematic diagram of 10watt led bulb driver pl.